Amid Blackout in Venezuela, Maduro and Guaidó Hold Dueling Ralliies With some parts of Venezuela still experiencing power outages, opposition leader Juan Guaidó and President Nicolás Maduro held rival rallies in Caracas. Protesters took to the streets Saturday with tensions rising between opposition leader Juan Guaidó and President Nicolás Maduro, as crisis-wracked Venezuela began to emerge from the chaos of an electricity blackout. 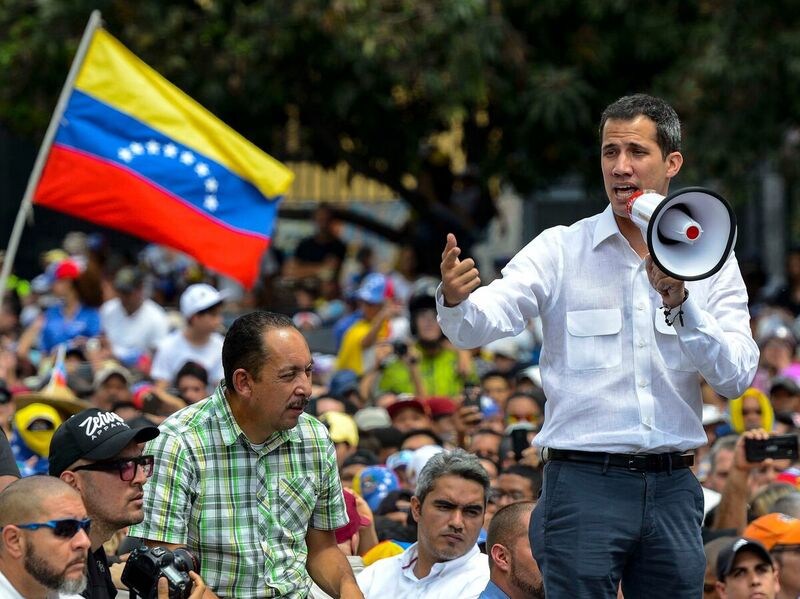 In the midst of one of the most extensive power outages in Venezuelan history, the country's opposition leader Juan Guaidó urged his supporters on Saturday to mobilize against the government of President Nicolás Maduro. "Venezuela, let's go to the streets," Guaidó, who declared himself interim president in January with endorsements from dozens of countries, said in a video on Twitter in response to the massive blackout blanketing most of the nation. Maduro, without offering evidence, blamed the outage that started Thursday afternoon on the United States, calling it an "electricity war." The blackout appears to have stemmed from a failure at the main hydroelectric plant in Venezuela, which has suffered from years of underinvestment. Guaidó claimed the outage knocked out power in 22 of the country's 23 states. By Saturday morning, power began to restore in the capital Caracas, but remained off for large portions of the country. State utility workers estimate it will be days before the national grid is completely restored, according to The New York Times. Protesters showed up in the the streets of Caracas in open defiance of a ban by the Maduro government on political rallies in the heart of the capital. NPR's Philip Reeves reports the rallies were particularly remarkable considering it wasn't easy for demonstrators to get there with the subway system out of service and a massive deployment of police, National Guard and army soldiers blocking the roads. 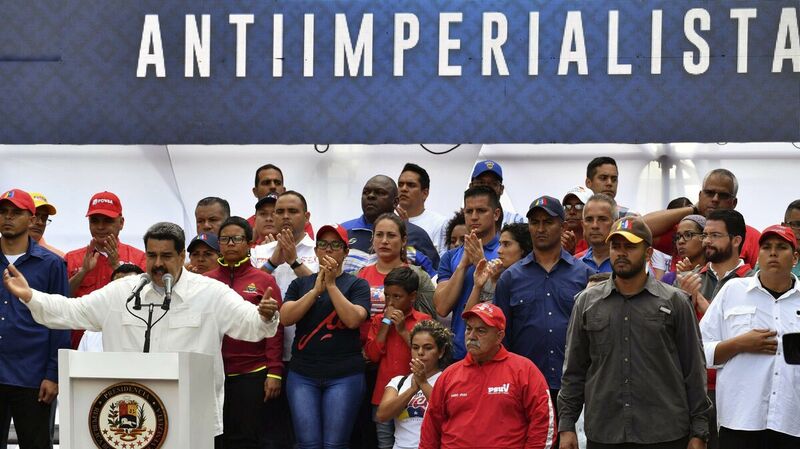 Maduro held his own rally inside the presidential palace for supporters, who believe they are the victim of a coup by the White House, Reeves reports. Venezuela's President Nicolás Maduro speaks to supporters during a rally at the Miraflores Presidential Palace in Caracas, Venezuela. In a tweet, Maduro said the U.S. is desperate to gain access to Venezuela's natural resources, but that Venezuelans will stand firm and defend their land. He concluded "Yankee go home! We are anti-imperialist!" After more than six weeks of uncertainty, many opposition supporters on the streets were frustrated. "Now we don't have lights, we don't have water. It's very hard to live here with this situation," Nela Garcia, 61, told Reeves. Garcia's family has been greatly affected by the crisis. One of her children has left the country, her other is still living in Venezuela, pregnant and unable to live a normal, quiet life. She's always nervous, Garcia said through tears. The power outage crippled hospitals, threatened already scarce food supplies, shut down businesses and schools and cut off the ability of Venezuelans to communicate with loved ones, near and far. "They haven't invested anything in the country, they have stolen everything," Garcia said in reference to Maduro's government. "They haven't invested in services, hospitals, schools. They're just a bunch of thieves." The blackout has also contributed to a general feeling of anxiety among the opposition, Reeves reports, noting that there's a desire for new ideas and new approaches. "We've never had this kind of pressure from the outside, it's the first time." Garcia said. "Now that we have it, we feel nothing is happening. What else do we need to take this government out?" But Garcia said she doesn't plan on giving up on Venezuela. "I want to live in my country, I want to stay here," she said. "I could live outside, I have the possibility. But I want to live here, I want my kids to live here, I want my grandkids to stay here. This is a great country."